There are times when the official needs to take an assertive approach to a situation eg. when the game is getting ‘hot’, or when a participant is questioning a decision in a demonstrative manner. At other times, the official will use a less assertive and calm approach eg. when the competition is being conducted in a good spirit. Sufficient strength of voice to convey the message so that participants are able to hear the decision. There are times on competition day when the participant or coach has a request of the official. This might be prior to a competition, for example, seeking some information regarding the rules/laws, or a participant not happy with a decision during the competition. 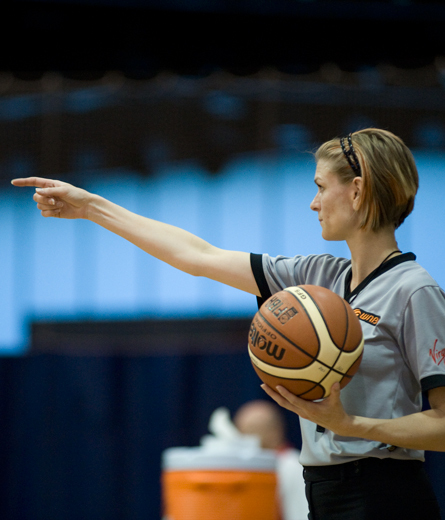 When participants or coaches approach an official with a problem or query, it provides an opportunity to engage in discussion and seek a greater understanding of each others position, views and understandings. The strongest influence on the outcome of all communications is the ability to listen effectively. When the official listens effectively, they can respond appropriately. Listening enables the official to put meaning to the sounds they hear. Listening is the ability to receive, attend to, interpret and respond to verbal messages and other cues, like body language, in ways that are appropriate to the purpose. An important task of many officials is to complete a report after the competition. Written and oral communications provide messages, instructions, information and feedback to a wide range of people in the sporting environment. It is essential that the official ensures that what is reported is honest, respectful, trustworthy and that the report is delivered with integrity. The officiating environment can be challenging and potentially hostile. Dealing with conflict can be tough for a confident official, let alone an inexperienced one. Good officiating relies on dealing with conflict professionally and positively. There are occasions when conflict in the sporting environment is inevitable, however developing strategies to minimise conflict from arising is vital. The following tips may assist officials’. Remain objective, no matter what prior knowledge of participants/teams an official has. The official is often called upon to manage conflict situations and attempt to resolve them. It is virtually impossible for sports officials to avoid dealing with conflict, even when they have implemented prevention strategies. Be professional: Speak clearly and stay composed in heated situations. This demonstrates confidence in managing the situation. Avoid argument or debate, and don’t try to bluff through with unjustified rulings. Remain calm: Don’t over-react. Stay relaxed and adopt a low-key posture/body language. Use objective, neutral language. Address the problem - not the emotions: Try to put aside the emotions of all parties. Emotions inevitably inflame the situation. By dealing with the facts and the available evidence, the official is more likely to be seen as making a fair and appropriate decision. Focus on the person: People are not objects, and they don’t like being treated as such. Acknowledge a participant with eye contact and use their name if possible. Recognise that they have something to say, and don’t just dismiss them. Be fair: Avoid team or individual bias at all costs. Demonstrating integrity is one of the greatest assets of an official. Be confident and open: Don’t be defensive or try to justify actions. Clarify decisions when appropriate, based on the facts and the evidence presented. Be firm: Deal with unacceptable behaviour firmly and quickly. Set boundaries in a polite, professional and assertive manner. Remember that 90% of conflict occurs not because of what was said, but the tone in which it was said!